Our global, cross-brand production network safeguards the processes from the supplier to the factory and assembly line, and from the factory to dealers and customers. Enduring efficiency is a prerequisite for our competitiveness. We meet challenges of the future with holistic optimizations, forward-looking innovations, flexible supply streams and structures, and an agile team. In fiscal year 2018, the global vehicle production volume surpassed the previous year’s level, reaching 11.0 million units. Productivity increased by around 5.3% year-on-year, despite the continuing difficult conditions in many markets. With division-specific initiatives we have created content clusters in which expert teams work on the strategic topics relevant for production in the Group. Examples include the competitive design of our global production network, the reduction and offsetting of environmental impact throughout the production process, and digitalization with its implications for production and working processes and for collaboration. The overarching aim is to increase productivity and profitability. With the production strategy, we have laid the foundations for the successful and sustainable enhancement of our production. We use regular reviews to ensure that we constantly align our activities to the current challenges. With twelve brands and 123 production locations, aspects such as consistent standards for product concepts, plants, operational equipment and production processes are key to forward-looking production. These standards enable us to achieve synergy effects, respond flexibly to market challenges, make optimal use of a flexible production network and realize multibrand locations. Currently, almost half of the 45 passenger car locations are already multibrand locations. The Bratislava site continues to serve as a prime example, producing vehicles for the Volkswagen Passenger Cars, Audi, Porsche, SEAT and ŠKODA brands. The newest multibrand location is Wolfsburg, where production of the SEAT Taracco began in the autumn of 2018. The Volkswagen Group has set itself the goal of becoming one of the world’s leading providers of battery-electric vehicles by 2025. The basis for this is the introduction of the Modular Electric Drive Toolkit MEB, which we will use to complement our range with additional battery-electric vehicles. In order to design multibrand projects and for electric mobility to be cost-effective in conjunction with existing concepts, it is important to make production highly flexible and efficient. Making maximum use of potential synergy effects is also a decisive factor for the success of future vehicle projects. Using common parts and concepts as well as identical production processes enables reduced capital expenditure and provides the opportunity to better utilize existing capacities. The future will also see electric vehicle projects at multibrand locations such as Zwickau, Germany and Anting, China. We are constantly enhancing our production concepts and aligning them with new technologies. The targeting process anchored in our strategy serves to realize ambitious targets in individual projects as part of a cross-divisional approach. The Volkswagen Group’s production network is comprised of 123 locations in which passenger cars, commercial vehicles and motorcycles, as well as powertrains and components are manufactured. With 71 locations, Europe remains our most important production region for vehicles and components. There are 28 sites in Germany alone. The Asia-Pacific region has 34 locations. We have five locations in North America and nine in South America. The Group operates four locations in Africa. 2018 saw 52 production start-ups: 29 for new products and successor products and 23 for product upgrades and derivatives. Capacity utilization of the locations in the Volkswagen Group’s production network is further enhanced by supplying the locations with complete knock-down (CKD) kits for local assembly. Our aim is to continuously and sustainably improve our production workflows at all the brands’ and regions’ locations. A key component for achieving excellence in processes in production and production-related environments is the Group production system; we are further consolidating this and increasing the extent to which it is used. Leadership and individual responsibility are the foremost factors, embedded in a culture of respect and collaboration. A factory must work at optimal capacity if it is to achieve the goal of continuing to manufacture high-quality products that give customers maximum benefits at competitive prices. This is made possible by the standardization of production processes and operating equipment early on in the line, based on the principle of concept consistency. This ensures that common design principles, joining techniques and joining sequences, but also installation and connection concepts are applied in the brands’ development and production areas. The principle of concept consistency is used to establish a foundation for creating efficient logistics and manufacturing processes. 3D printing is one of the key technologies for Industry 4.0 and digitalizing the automotive value chain. The process opens up wholly new opportunities in the areas of development, design and production. Due to the digital nature of the technology, which requires no tools whatsoever, components can be flexibly implemented directly from digital drawings, and completely new designs and component geometries can be created. The technology of 3D printing has been successfully used for building prototypes for many years now and has advanced rapidly in recent years – also accompanied by new areas of application at Volkswagen. The specific characteristic of this technology, an additive manufacturing technique, is its influence along the entire automotive value chain. It is used for early design studies, for building prototypes, for manufacturing tools and operational equipment, for producing parts in small batches and for the manufacturing of replacement parts in after sales. The materials available for 3D printing range from plastics to fiber composite materials and metallic materials. However, there is still a long way to go before large-scale automotive production applications are possible. Here, Volkswagen leverages the diversity of the Group, achieved through close collaboration between its brands, and cooperates with leading technology providers and research institutions. For example, the Volkswagen Passenger Cars brand has partnered with printer manufacturer HP and component producer GKN Powder Metallurgy to become the first automaker to use HP Metal Jet, the latest 3D printing technology. Where the design and introduction of new production technologies is concerned, affected staff are involved in the redesign of workplaces and processes from the outset. This is an important prerequisite if new technologies and solutions are to find the necessary acceptance. 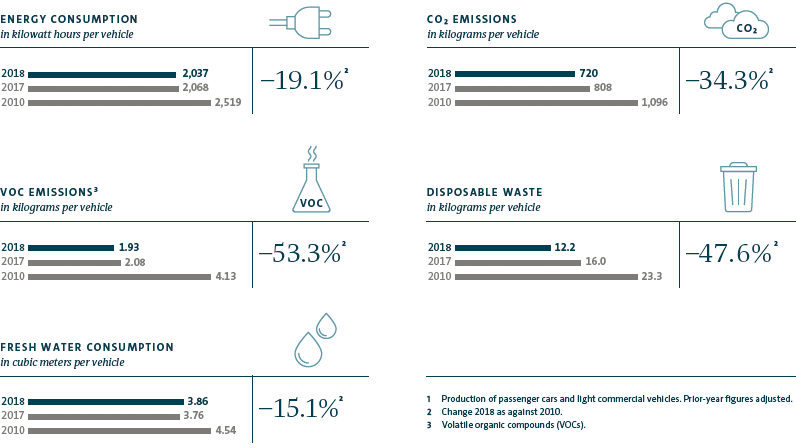 In this context, the Volkswagen Group has set itself the goal of reducing the five key environmental indicators of energy and water consumption, waste for disposal, and CO2 and VOC emissions in production by 45% for each vehicle produced by 2025 – starting from 2010 levels. This objective applies to all of the Group’s production locations and is derived from our environmental requirements for production processes, which are anchored in the Group’s environmental principles. The charts above show the development of these indicators. We are encouraging networking and communication between the brands worldwide in order to leverage synergies. Our environmental experts meet regularly in working groups; in addition, we train our employees on the topic of environmental protection. To identify and implement site-specific cost-cutting measures, the Environmental Task Force analyzes manufacturing processes, factory supply systems and resource and energy flows at the Group’s locations and evaluates the impact of the efficiency measures. Based on the experience from the analyses in several brands and regions, the team can systematically reinforce and spur on the transfer of measures. We record and catalog environmental measures in an IT system and make these available for a Group-wide exchange of best practices. In the reporting period, around 1,500 implemented measures in the area of environment and energy were documented in this system. They serve to improve infrastructure and production processes for passenger cars and light commercial vehicles. These activities are beneficial from an environmental and economic perspective. With a series of effective, innovative measures, we were once again able to reduce environmental indicator levels in the reporting period, while at the same time improving production processes. Logistics contributes to the Volkswagen Group’s focus on the environment by analyzing the emissions of the entire transport chain. The Green Logistics initiative promotes alternative means of transport and sustainable, energy-efficient transport systems. Building on the dialog established between Group Logistics, Scania, forwarders, authorities and oil companies at the LNG Truck Day in September 2017, the concept of LNG-trucks (liquefied natural gas) will now be put into practice. The aim is to have LNG trucks drive on many routes in the future, which will require an appropriate fuel station network. Together with its service providers, Group Logistics is planning to deploy approximately 100 LNG trucks in northern Germany in the medium term. The first trucks hit the roads in January 2019. Where transport activities are concerned, maritime transport represents another important starting point for reducing CO2 emissions. In mid-2019, Volkswagen Group Logistics will put two LNG-powered charter ships into service. The low-emission LNG ships will transport vehicle models produced by the Volkswagen Group between Europe and North America. To ensure that our employees can provide the best possible support along the path to achieving our environmental targets and can also help shape this path, in-house training courses on green logistics and lectures at universities are a fixed part of the vocational training program.